As a Hunter, be ready to quickly slay anyone who comes your way and match their ability! 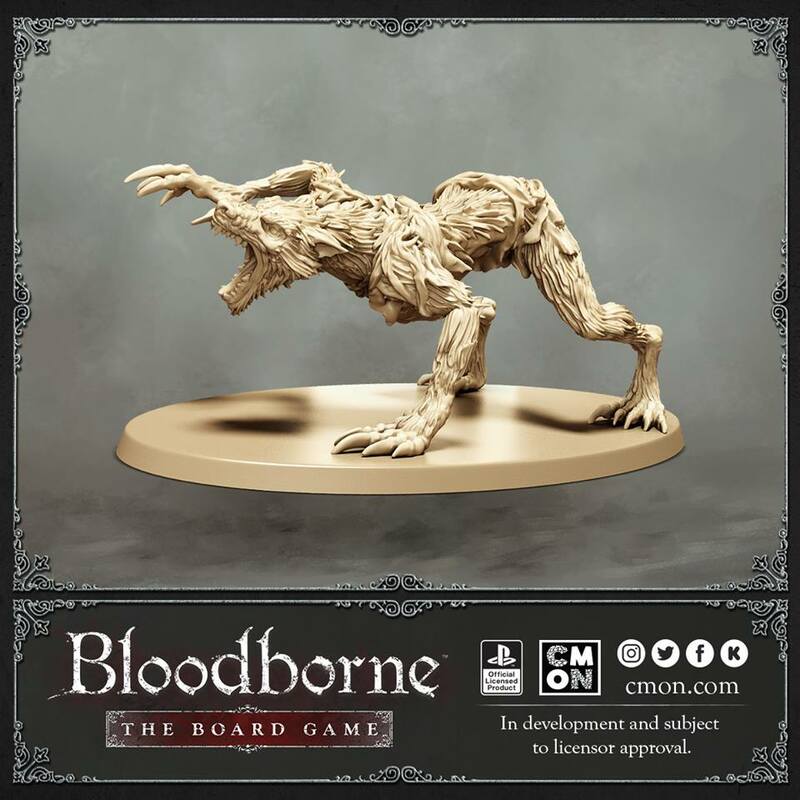 The Scourge Beasts strike at lightning-fast attacks and have sudden dodges… Coming soon to Kickstarter Bloodborne: The Board Game. Um den Respekt vor dem Feind geht es im dritten Teil des Entwicklungstagebuches. -Me, shortly before being sent back to the Hunter’s Dream by two Scourge Beasts. One of the elements of the Bloodborne video game I most enjoy that I feel may be underappreciated by some is the fact that at no point during the game do enemies stop being a threat. I don’t mean that in a “the game is always challenging” type of way (It’s Bloodborne… I think its reputation speaks for itself), I mean that in the fact that even the first enemies you encounter, the basic Hunter Mobs in Central Yharnam, will still completely wreck your day if you get reckless. Doesn’t matter if you’re just messing around before going after the final boss, having literally slaughtered everything else in Yharnam and the Chalice Dungeons, that first machete-wielding Hunter Mob can and will still put you down if you get lazy or make a mistake: This fact was one of the most important elements that needed to be brought over when transitioning to the board game. People get a lot of ideas in their heads when they hear “dungeon crawler” in relation to boardgames. For myself it immediately invokes thoughts of goblins, skeletons, zombies- the typical fantasy affair you’d come to expect. The thing they all have in common, however, is they’re usually just fodder blocking your way to the real challenge, aka the boss. You know these guys aren’t actually a threat to you, they’re basically walking loot-dispensers and free experience. And that is absolutely not what the enemies in Bloodborne should ever be. That’s actually one of the primary reasons I don’t refer to Bloodborne as a “dungeon crawler”- because of the specific mindset and images that the term invokes. I much prefer “action exploration”, which I feel much better relays the proper mindset one needs to come into the game having. Most importantly, however, I want to distance players from the idea that the enemies they come across are anything less than a major threat at all times. Combat is an important aspect in both the Bloodborne video game as well as the boardgame- the primary thing you’re going to be doing, in fact. At no point in any of those encounters should you ever feel like you’re not one mistake away from being cut down and sent back to the Hunter’s Dream. Sure, some enemies may not be as threatening as others- no one is going to argue that the “basic” Hunter Mobs are as scary as, say, a Scourge Beast or a Chapel Giant, but at all times players should feel like they present a genuine challenge and, more importantly, that choosing to engage these enemies is a calculated risk that could end up costing you. Ok, I’m fighting a Huntsman’s Minion. I know he’s big and slow and if I try to match him blow-for-blow I’m going to become acquainted with the ground very quickly. Alright, so I go with a big slow attack and throw a Vitality card down to mitigate some damage? Or maybe a Skill card to increase my attack’s speed- If I kill him before he hits me then I don’t need to worry about how much damage he could potentially be doing. These are the types of decisions you’ll need to consider when fighting every enemy you come across. This isn’t a game where you’re going to cut down swaths of foes, laughing and looting the entire time- No- This is Yharnam. This is Bloodborne. This is a board game where if you get cocky, thinking you’re so much smarter than the board and the enemies, it’ll remind you just how wrong you are by stunning you into a Brick Combo because you got greedy and thought you’d go for extra damage instead of a safer approach. I would say “Good Fortune” when out there on the Hunt, but luck has little place here, and your mistakes are your own.